Management, Sales and Marketing Specialist. community. Specializes in the formation of business communities and networking. A founder of the Israeli Construction Center for nearly two decades as CEO of the group. 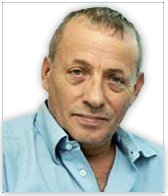 Kobi was born in Be’er Sheva, resident of Kochav Yair, marriedto Shlomit + 3 sons. Development executive with 20 years of experience in the field of information systems. Co-developed customized computer systems that operates at leading companies in Israel. Offer previously served as director of information systems and information security manager in Uri Dori. Offer is 43 years old, married + 3 graduated in University of Haifa. Jane serves as chief financial officer since 2008. In the internal structure of bmby Jane is also responsible for the human resources area. Jane is 50 years old, married + 2, economist with master degree. Pioneer of the interactive internet in Israel. For over two decades specializes in the development and implementation of marketing systems for dozens of companies in Israel and abroad (CRM, lead management, telephony, mailing systems and sales robots). In 2000-2002 served as CEO of Coral Tel (Yad2). Graduate in Information Technology at the Technion (Haifa). 47 years old, married +3. We are now in the post internet era deep inside the mobile web, in the near future will begin the Wearable Computing era which presents an extraordinary and exciting challenge to the marketing industry. Pioneer of interactive web domain in Israel for more than two decades specializing in the development and establishment of systems marketing for dozens of companies in Israel and abroad (CRM, lead management, telephony, mailing systems and robot sales). In 2000-2002 he served as CEO of Coral Tel (Yad2). Graduate in Information Technology reserve the Technion in Haifa, 47, married + 3. In the last decade we lead the revolution of technology marketing, a breakthrough in the perception of global marketing. The new tools have become the marketing of Mathematical Sciences and allow accurate measurement of your marketing and advertising. So you can predict almost certainly the results of advertising and marketing processes and to plan in advance and effectively the marketing budget and significantly save costs. We are in deep post and web and mobile in the near future will begin the very wearable computing (Wearable Computing) which is an extraordinary challenge to the marketing industry. Development Manager with experience of 20 years in the field of information systems, and co-developing customized computer systems that operate at leading companies in Israel. He previously served as director of information systems and information security manager in a. Dori. 43, married with three graduated from the University of Haifa. Has extensive experience in managing companies and our leadership success. Causes leading Israeli business community. Specializes in business communities and networking processes. After 15 years as a member of Kibbutz Netiv XXXV started working as Marketing and Sales at Trlidor. Born in Be’er Sheva resident of Kochav Yair, Shlomit married with three sons. And served as an observer and mentor combat company commanders, marathoner life and business. Slogan: A good name is better than good oil ..
Has an experience of over 15 years in the computer field service departments, including 10 years at Tower Semiconductors and Director of FAB infrastructure via HP-OMS. In recent years, he served as director of global infrastructure area of the company Kulicke & Soffa. 52 years old, married, 2 children. Serves as director of the finance department and human resources since 2008. In 2006-2008 she served as a bookkeeper in the company. 50 years old, married + 2, economist, master’s degree.